Last year, a modeling agency in the UK were on the hunt for new faces and decided to do something different, rather than the usual route of castings in person. They decided to use social media to discover new talent and throw the net open wider than any casting director could possibly find. Models 1 teamed up with Slink Magazine, a plus size publication, and used Instagram to find their new model, using the hashtag #makemeamodels1curvy. The search was such a huge success with over 6,000 entries (who says plus size models are a niche market!? ), garnering plenty of positive media attention along the way, that the agency has decided to bring it back for a second time. 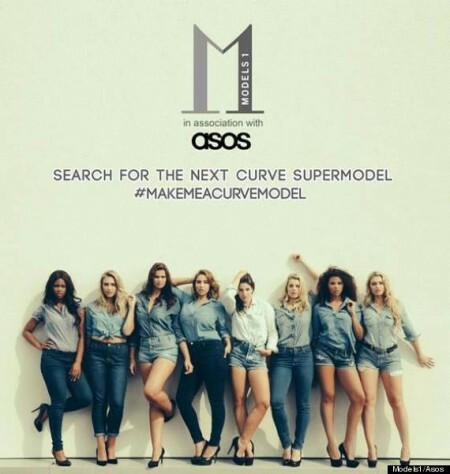 This year they have teamed up with popular online ecommerce fashion site ASOS to “find the next Plus Size Supermodel”. Last year the winner was 21 year old Simone Charles (pictured above) who is a size 18 and graced the cover of Slink Magazine as part of her prize package, and also became the face of luxury denim line Beauty in Curves. Simone told the Huffington Post UK that her life changed dramatically since winning the model search, and had some major opportunities open up for her which may have never come about previously. She also mentions how searches like this are putting plus size and varied size women at the forefront of the modeling world, showing consumers that there is no longer a homogenous look to the industry to aspire to. “There have been massive steps in the plus size industry in the last year. Some of the girls from Models1 Curve exclusively walked the runway in New York earlier this year, Ashley Graham (an American plus model) graced the covers of Elle magazine,” she said. This year’s competition closes on June 9, and they are asking women to post photos to Instagram using the hashtag #makemeacurvemodel. The winner will secure a contract with Models 1 curve division, a shoot at ASOS Studios modeling the ASOS CURVE collection, and over $800 USD in ASOS vouchers. Models 1 said they believe beauty comes in different sizes, and using social media to change people’s attitudes was a great way to convey the message publicly. ASOS also echoes the attitude that presenting different types of body shapes to their customers is important. And for those women who will be uploading an entry to Instagram, Models 1 says they want to see natural faces as much as possible with little makeup, and not too many filters. They’re not looking for poses, but women in their natural, beautiful state. Wouldn’t it be awesome if every casting in the fashion world had a mandate like this?